Abstracted, Building, Blocks - Ramblings of Mad Shutterbug & the Border Collie Bros. Yes, it is quite deliberately done this way. Do not adjust your horizontal nor your vertical. Should you do turn your head to feel more 'properly' oriented, yes it is a hallway. Specifically, actually, it is the tunnel between DONT (Drab Old North Tower) and SNST (Shiny New South Tower) of Hospital, where I work. 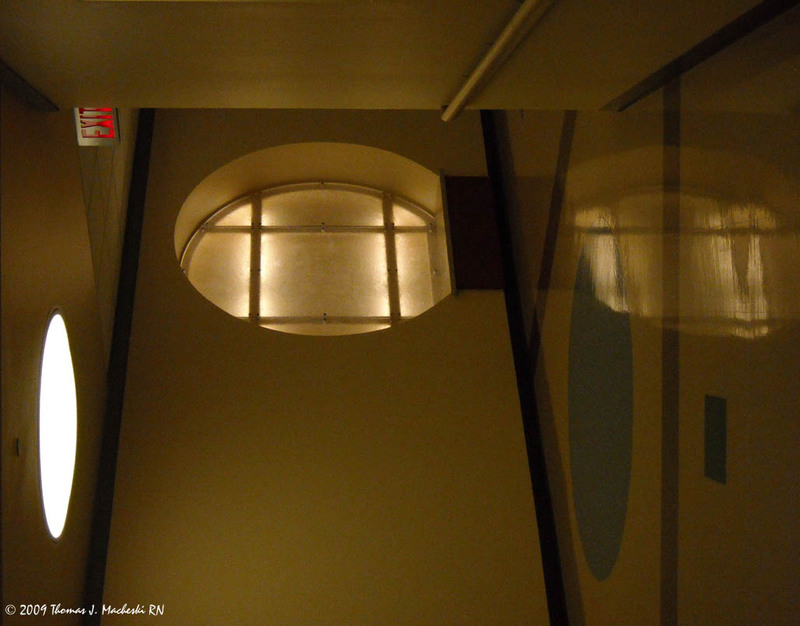 Some of the lighting in the tunnel is provided by these 'moon windows'; other areas the lighting is different. Additionally, the path is broken by angles and consequently people feel less as if they are in a tunnel and more that they're in a hallway. Besides presenting a representation of a portion of the place I earn my daily bread, I plan to use this in some of my SF/Fantasy related imagery. Hence, building blocks. For whatever reason, the Second Site where I post these (actually cross-posting to here on LJ) is not loading up from home. So... here we are, to keep the commitment of a Pic'O'Day.